Exciting practical activities form a crucial part of learning science and the IGCSE curriculum requires practical work at almost all the levels. We have four well equipped laboratories, meeting international standards, dedicated to the three sciences namely Physics, Chemistry, Biology and one Montessori lab for the preschool students. In addition to these, the computers Lab, the Language Lab, and Mathematics Lab give a breadth of opportunity for our students to enjoy an all round development. Dr.Maria Montessori, an Italian doctor and founder of the Montessori System found children between the age of 21/2 - 6 yrs able to learn more, a capacity which Dr.Maria called absorbent mind. She had compared it to a sponge soaking in liquid and had explained that if a child’s absorbent mind is exposed to appropriate learning experiences in the developmental stages, especially during the sensitive period of growth, which is when the child is more receptive to learning, it will accelerate mental skills and growth. 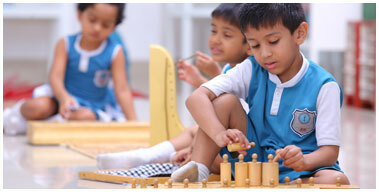 Maria Montessori developed a curriculum, “Prepared Environment” as she named it, which makes a match of right materials to the child’s stage of developments. Our school adopts learning activities which help children acquire skills related to sensory differentiation, matching and sorting by size, shape, sound, color, smell and other dimensions, as carried out in Dr. Maria Montessori’s curriculum. It also includes learning practical skills such as polishing shoes or setting a table, stringing beads, cutting vegetables or washing plates. We also use Didactic Apparatus for more advanced academic skills in reading, writing and math skills through hand-on manipulation approach. This method is self correcting one, which develops concentration, order, hand-eye coordination and other skills in children. No theory can be substantiated without experiment. The best way to learn Physics is the laboratory works. MAIS has a tally functional Physics laboratory with apparatus of required standard. Lab activities reveal the crux of subject and the world of physics to the students. Science is taught as an experimental subject at MAIS. That means students spend time equally in lab activity experiencing science, rather than passively having it demonstrated to them by the teachers. A strong emphasis on scientific method is inculcated in students from Grade-VI onwards. The Chemistry Lab is well equipped with the latest technological devices according to the Cambridge and ICSE norms. It allows students to explore chemical concepts, view changes in matter and acquire scientific skills in an atmosphere similar to professional scientific environment. The student will learn that chemicals are not something just found in laboratories. Also, they will develop an appreciation of the Chemistry that is used in our everyday lives. To understand various concept and facts in science the practical works are very important. Mar Athanasius International School has a well- equipped Biology Laboratory which helps students to make their Biology lesson more interesting and amazing .We have modern apparatus which include Compound and simple microscopes, dissection sets different preserved specimens, models, charts and permanent slides .Effective use of laboratory from primary classes onwards makes Biology a very interesting subject.